Deluxe Edition sees the entire record remixed by Dave Mustane and producer/mixer Bill Kennedy, completely digitally remastered, 4 original 1984 demo's are added as bonus tracks. Also includes original artwork intended to be on album packaging, song by song liner notes by Dave Mustane & bassist David Ellefson. Demo versions - 'Last Rites/Loved To Death', 'The Skull Beneath The Skin' and 'Machanix'. Loud Records.... More >> Killing Is My Business... And Business Is Good! Megadeth have outdone them selves with this release. The remastering of a classic Speed/Thrash album circa ’83 – ’84. This release includes the completely redone cover art (The one the band REALLY wanted), excellent remixes that really brightens up the mix and brings the somewhat dismal mix of the original (Combat records) to a wonderful clarity and heaviness. 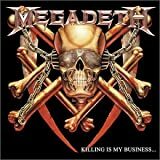 Dave Mustaine starts the album with a scorching commentary on what his life was like just after the “Firing” from Metallica and his mindset when putting together his band. Then Dave Ellefson’s and Scott Ian’s (From Anthrax) introduction. On top of that you get commentary from both Dave’s (Mustaine and Ellefson) on each song. The Final topper is the 3 demos at the end (Last rites/Loved to deth, Mechanix, and The Skull beneath the Skin) which are wonderful to see how the song transformed into the groundbreaking tunes they’ve become. Congratulations to Dave Mustaine and Dave Ellefson for being able to get this chance to remix history and make it better than it was before. Alot of people never got into Killing is my Business because of the production flaws , but this remastered edition brings the entire album to life. Dave Mustaine’s voice sounds incredibly clearer , and it is much easier to hear the drumming of Gar Samuelsson , who happens to be whom the album is dedicated to. The highlights of this album are Mechanix , Skull Beneath The Skin , and Looking Down The Cross , among others. All these songs have a completely different sound to them on the remastered version. Also , you’ll find some comedy on the album. Dave’s cover of “These Boots” , which of course was taken off the original Killing is my business because of copyright issues , is back on this album. The only problem is that the original song write Lee Hazelwood did not allow Dave to use many of the obscene lyrics in his version. Dave has put the song on the album with the majority of the lyrics bleeped out. It is hilarious to listen to the song. As if that isn’t enough , you get Megadeth’s 3 demo songs from 1983. These have a raw power to them , they sound tremendous , although the quality is not that good , Dave did not have a good tape of these recordings to use. Anyways , I’m sure every Megadeth fan has already bought this album. If you haven’t bought it , it’s worth your $.. I own the non-remaster version of the CLASSIC first Megadeth album, commonly known as KIMB. I had the original pressing with an unedited These Boots, but my friend lost it, so I bought another copy but it was missing the Nancy cover song. Oh well, it was OK but really the weakest song on an otherwise flawless CD. KIMB is non-stop thrash metal bliss from opening to end. Every track is awesome. The opening track is haunting and scary and then just flat out kicks a**. And you won’t stop to take a breath until the entire CD is finished. It’s THAT good. I’d say the standout tracks are Killing is my Business, Skull Beneath the Skin, Chosen Ones, and Looking Down the Cross (this song is brutal, I get chills listening tio the lyrics and incredible musicianship). Mechanix has better music than Metallica’s Four Horsemen, but Metallica took the cooler lyrics. Chris Poland’s lead guitar work is amazing. Gar on the drums… you have to hear it to believe it. The original Megadeth line-up with Poland and Gar was never beat. True metal legendary album. 5 stars all the way. An essential must have CD. I am so ticked (of course I would use other words) I was so excited about once again having this album (since I first purchased it on cassette in the 80s)and was with the remixes and the new art (although I personally preferred the originals) but these where much better mixes than the so far so good so what those where very disappointing compared to the originals….anyway, what really put me over the edge was the badly bleeped out new version of these boots! It’s like they could have just muted the vocal track! or remixed it out but no instead an outrageously ridiculous loud beep over all the music ( you cant even hear anything else! over it) and he swears through half the song so…its pointless!!! shouldve been mixed out so we could still enjoy the song or removed all together just %$E(&^$)me off! now I realize that Dave undoubtedly wanted us to know and be bothered….and I realize now (since I looked it up) why…but it was unacceptable and ruined the whole of the purchase! yes it ruined it in my eyes! I was very excited about hearing this cover again and Dave should have thought more of the fans then wanting to prove something or vent his frustration all he did was passed it on to us! Credit must be given to Dave Mustaine for wanting this headbanging record to sound good. The sound is loud and crunchy and the drums are absolutely ear-kicking… The removal of the reverb gives the album a completely different ambiance (the process was not as successful on “So Far, So Good…”). The new cover is actually quite interesting even if it doesn’t freak me out as much as the original. Now to the bad part… I know it’s been said before, but this reissue is completely ruined by the BEEEEEPs on “These Boots”. I’d recomend both versions of this album. For the original one look for the edition with “These Boots” UNCENSORED. It’s definitely a must get.